Soybean oil, high fructose corn syrup, water, distilled vinegar, egg yolks, contains 2% or less of each of the following: salt, spices (mustard flour, celery seed), potassium chloride, xanthan gum, onion powder, potassium sorbate and calcium disodium edta (used to protect quality), garlic powder. Hellmann's thick, creamy Coleslaw dressing makes delicious coleslaw, a favorite side, a snap. Created by chefs for chefs. Ready to use. Shake well before using. As part of Unilever, we understand consumers, your guests. We use this knowledge to help chefs and caterers keep up with people’s changing tastes. 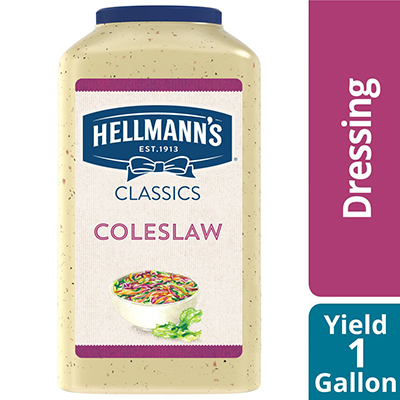 Hellmann's Coleslaw Salad Dressing offers premium quality with shelf-stable convenience. This gluten-free salad dressing is ideal for creating delicious coleslaw, a favorite side dish. Great as an alternative applications for marinades, dips, glazes and finishing sauces.